I must admit that I don't particularly enjoy cooking. However, what my family eats and what goes in their bodies is of the utmost important to me. That poses a problem, huh? Therefore, I must cook...because I want to only feed my children and husband organic and healthy food! And I actually am starting to enjoy cooking for my family (after 5 years!) because I love to see them enjoy the food I make while knowing it is healthy and organic and great for their bodies! However, there are days I DO NOT WANT TO COOK! That has seemed to happen a lot lately with a newborn. I am exhausted and the last thing I want to do is figure out a meal, plan it and make it at the end of a long day. And heaven knows, I don't get out of the house to get to the the grocery store...so I never have any ingredients I need either! 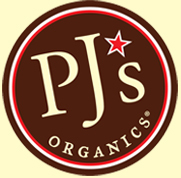 This is when I turn to one of my new favorite easy, but healthy and organic meals - PJ's Organics Burritos. I love the nice selection of different flavors including Traditional Chicken, Steak and Cheese, Skinny, Five Layer, and even a Breakfast Burrito! The only thing I wish for is a Vegetarian option. I am not a big meat person so I would love just a good old beans and cheese version! So next time you are feeling a little lazy or overwhelmed...or just plain sick of planning meals, turn to PJ's Organic burritos to still give your family a healthy, filling, and organic meal just like you would! It is like having a personal chef in the house that makes the burritos exactly how I would!